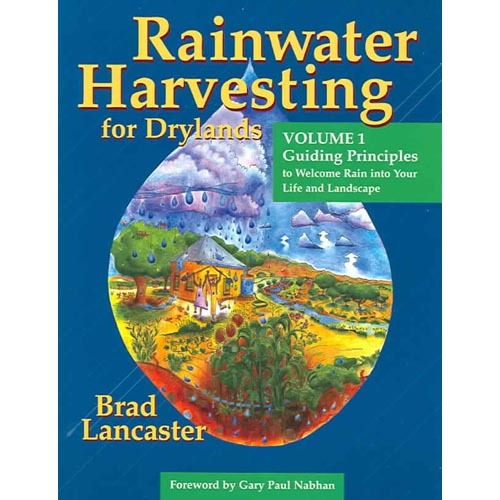 Rainwater Harvesting for Drylands and Beyond: Volume 1 Guiding Principles to Welcome Rain into Your Life and Landscape by Brad Lancaster. This is an excellent resource for anyone interested in rainwater harvesting. Turn water scarcity into water abundance! Rainwater Harvesting for Drylands and Beyond, Volume 1, is the core of the complete three-volume guide on how to conceptualize, design, and implement sustainable water-harvesting systems for your home, landscape, and community. This book enables you to access your on-site resources (rainwater, greywater, topsoil, sun, plants, and more), gives you a diverse array of strategies to maximize their potential, and empowers you with guiding principles to create an integrated, multi-functional, and water-sustainable water-harvesting landscape plan specific to your site and needs. Clearly written with more than 40 photos and 115 illustrations, this volume helps bring your site to life, reduce your cost of living, endow yourself and your community with skills of self-reliance and cooperation, and create living air conditioners of vegetation growing beauty, food, and wildlife habitat. Stories of people who are successfully welcoming rain into their life and landscape will invite you to do the same!